The sides of this head turning 'do are clipper cut short and close to the head while the top is left long enough to curl and style for maximum height and lift. This hairstyle is perfect for ladies with an oblong or round face shape. Strong hold product is needed to keep this look in place all day or night and regular trims will help maintain healthy ends. 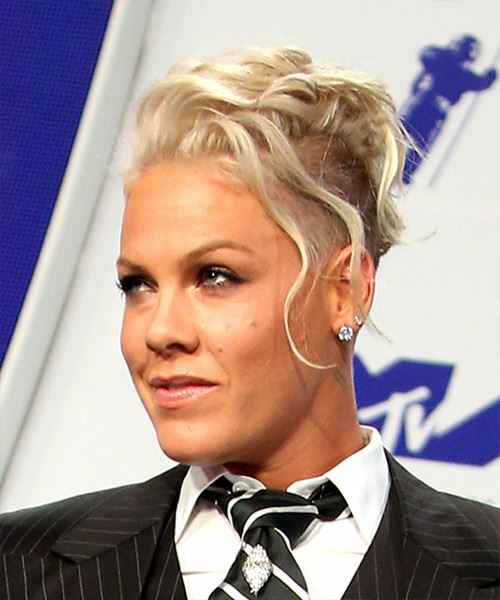 Pink goes for her signature look here with an edgy mohawk-style cut that is styled with maximum volume. The sides have been shaved close to the head, while the top layers have been left long and curled into corkscrew curls. 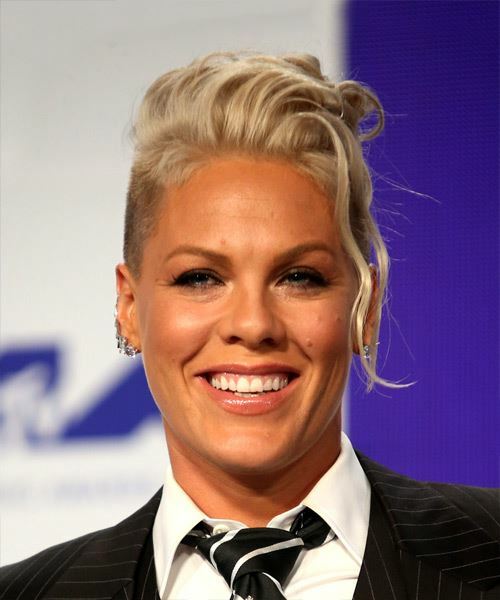 This style works well for for Pink's oblong face shape as it shows off her high cheekbones and adds height to her low forehead. Her medium-fine hair type looks thick and voluminous thanks to the styled curls at the crown, while the closely cropped sides have a slimming effect. Regular touch ups with the clippers are needed to keep the sides looking fresh and clean, while the top layers can be grown out longer if desired. A tumbling curl left out at the front finishes this style off nicely. Pink's color is another standout feature of this 'do. Her platinum blonde tresses look fabulous with this pompadour hairstyle, plus it matches with her tanned complexion and blue eyes nicely too. To achieve this shade, the hair must be first bleached out then toned with an ash toner to reduce brassy tones and give it a cool, silvery finish. This color is ideal for fair skin types and light eyes. 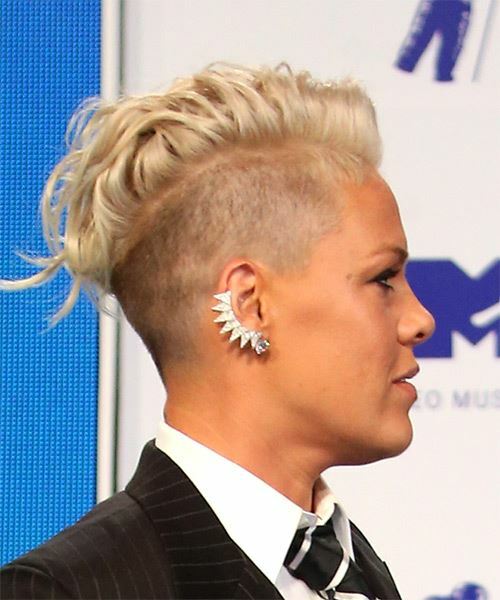 Alecia Beth Moore, known professionally as Pink, is an American singer, songwriter, dancer and actress. Scrunch spray gel through the curls after styling for long-lasting hold. Apply gel to your fingertips and then tilt your head forward and scrunch your hair. Apply gel to the palms of your hands, then starting a few inches above your ears, drag your hands through your hair until they met in a triangular fashion at the top of your head. Repeat this step using more gel for a longer lasting style. Apply gel to your fingertips then gently rake through your bangs, sweeping the hair to the left as you go.